Features like this presumably would lessen a big property’s storm water fee. Albany is going with the flow and headed for having a rain tax, although the preferred and more accurate term is “storm water utility fee.” The city’s intent to go ahead on this front was made plain at a work session of the city council Monday afternoon. ¶ A monthly utility fee would be collected on each property to raise money to run the storm drain system and comply with forthcoming state regulations on storm water that will affect Albany for the first time. ¶ The fee likely would be about $4 a month for the average Albany residential lot, proportionately more for larger properties. ¶ It would take 18 to 24 months to go through all the steps necessary before the council could enact the new utility system and fees. ¶ About 60 Oregon cities have long had such fees. Albany has used sewer funds to pay for its storm-related facilities such as drains and pipes, many of which need repairs or replacement. When the fees are in place, Councilman Floyd Collins thinks sewer rates might not have to go up as fast as now scheduled. The storm water system will have revenue of its own. That last part is puzzling, since the fee would be added to homeowners’ monthly utility bills. But apparently owners of large parcels, such as supermarkets and industries, could take steps to reduce the amount of rain water reaching storm drains, thus reducing their fees. If the water goes into a storm sewer, it reaches the river rather quickly and is part of the ocean in a few days. From there, it can evaporate and become rain that may help alleviate drought. We hide it under asphalt, not knowing when, or if ever, it will evaporate. People laughed at me when I told them this was coming. This is nothing more than a slush fund disguised as a “fee” for cities to do with as they will. They’ve raised our sewer and water bills each year – and will continue to do so – and now they’re adding a “hidden” tax. Correction and clarification from Jeff Blaine, City of Albany Public Works Engineering and Community Development Director: Regulatory requirements, aging infrastructure, and other system needs are driving up costs for managing stormwater in the City of Albany. On Monday, the Council received a presentation on the steps communities take to successfully implement a stormwater utility. 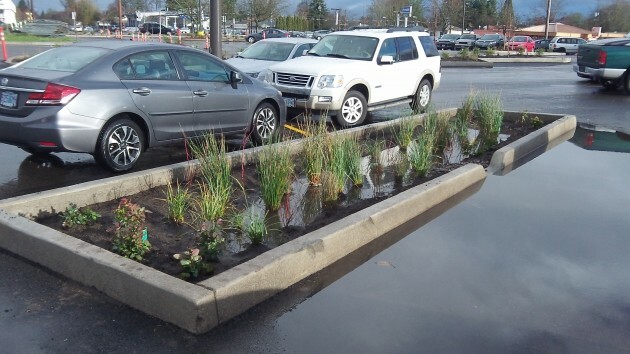 While a dedicated funding source for stormwater management is needed, Council is currently in the information-gathering stage and has not yet directed staff to bring forward a proposal for Council adoption. With Monday’s presentation being the first introduction to the utility concept, potential funding levels for a utility haven’t yet been introduced or considered. The $4 number provided by the consultant was in response to a question from Council regarding a recently implemented stormwater fee in the City of Bend. Stormwater fees in Oregon vary widely, from $1/month for residential property in Sweet Home to more than $26 a month in Portland. No work has been completed yet to determine what an appropriate fee level may be for Albany, should the stormwater utility concept move forward. I, a residential lot owner, would be willing to install some french drains on my land to reduce the runoff, but apparently the city finds that administration of such changes would be cost prohibitive compared to the actual tax/fee to be levied. Just imagine the calculations and inspections necessary for the city to determine how much runoff has been mitigated by a given improvement, and thus how much to discount the fee. Even if a property owner mitigated 100% of roof runoff into the ground, the applied discount on most parcels would have to be less than 50%. Our clay soils tend to stop absorbing the rain after a few tenths of an inch from any given storm, depending on many factors, like how long ago it last rained. I tend to agree that, at $48/year, it would be a long, long ROI if a homeowner hired anyone to implement storm water reductions, just on the labor cost for planning and construction (and permit? ), let alone materials cost and maintenance and, someday, repairs. Even swales fill up with sediment eventually, in a far off time. I am surprisingly not against this fee, if it is used specifically to improve the storm drains. I say surprisingly, because I am very much opposed to the constant (and documented in my case since 1997) 3% increase in my property tax bill, compounded, each and every year. After seeing what has happened in Flint, I would also support an additional fee on my water bill dedicated to replacing older underground pipes which could contribute to the type of lead poisoning disaster which happened there. ….about the stormwater issue — just to get us to this point. As usual, minimal members of the public bother to attend and get informed. Many more meetings will occur. It is not an option to do nothing, Period. I also support my taxes going to city buses. I may not ride them, but I do know that a sizable portion of our population can not afford cars nor insurance for cars. These folks frequently work for minimum wage, performing services that all of us use. If anything, I would like to see bus service expanded, especially evening hours, so they can actually get home when they get off of work at 9:00 at night. In other cities I travel to for work (and where I do use their buses to get from the airport to the city), I also see a large number of elderly using buses. I don’t know if that is the case in Albany or not, but that is another segment of the population that either 1) cannot financially afford a car or 2) have given up their licenses, who still need to get to the grocery store. I have no problem with my taxes subsidizing the bus system. You say you’re frustrated… That is a definitely a two-way street. All of the information we have to engage/discuss/deliberate at the meetings is available to the public simultaneously when it is to us. If you (and the general public) are unwilling to avail yourself to the information, read it, and then contact your councilor to meet prior to the meetings we have to discuss issues/options, we are then left to our own devices to come to a decision. It is frustrating to have staff pour time & effort into reports, from which we have to make decisions, and then have no one from the public there. Yes, council meetings are now broadcast live, but when you look at the number of viewers, it’s pretty minimal. The work sessions prior to council meetings are not televised. There is *much more* public give & take during those meetings. While it is your absolute right to do so, if you have no interest in the process, then don’t complain about the results.